Want to join in on our big monthly sales on subscriptions and earn more commission? Or, would you like to promote a certain feature or page of your affiliated site with your own affiliate link? We’ve launched a much-needed feature that helps you do just that. The Affiliate Link Builder, which is located in “Banners & Links” of your Affiliate Center, allows you to take any link from the site you’re affiliated with and add your affiliate code to it. Here’s a step by step guide on how to use it. 2. You’ll see the Affiliate Link Builder right above the banners. 3. Grab the coupon code from the newsletter or any other link that you’d like to promote. In the Affiliate Link Builder instructions, we use “20BONUSVIDEOS” as an example. So, if you’re an affiliate of any of the Innovative Language sites, simply grab the coupon code from the newsletter and follow the URL format, depending on your affiliated site. Or, wait until the sale begins and use the coupon links we send out in the sales e-mails. For all other links, simply grab the link from the URL bar while you’re on that page. Scroll down below to get an idea of other potential links that you’d want to promote. 4. Create your Custom Affiliate Link. Got the link from step 3? Now, paste it into Affiliate Link Builder as shown below. Then, click on “Get Link” to get your Custom Affiliate Link as shown below. You’ll see the link appear right under the “Get Link” button. These links can get quite long so feel free to use a link shortener. Take a close look at the URL. The crossed out part that after “r=” is your Affiliate referral ID number and confirms that this link now contains your custom code. 5. Share the link with your readers! If there’s anything that prompts buyers to act, it’s a nice discount and a strict deadline. Remember, you can link readers to other parts of the 101 site. Want to promote another part or feature of our 101 website such as the Word of the Day? Normally, the affiliate links take visitors to the sign-up form on the homepage. Why? This is the fastest way for them to sign up and subscribe down the line. However, if you’d like to promote another page of the site, use the Link Builder to add your affiliate code to the link. Public User Interface with Free Lessons (Visit at 101.com/index.php). Viewable by new visitors or in a private or incognito browser mode. Note: The links provided in the Affiliate Center leading to the 101.com homepage are your best option to convert readers as that’s where they immediately sign up. Please note that you must first be an affiliate of a certain site in order to create affiliate links for it. 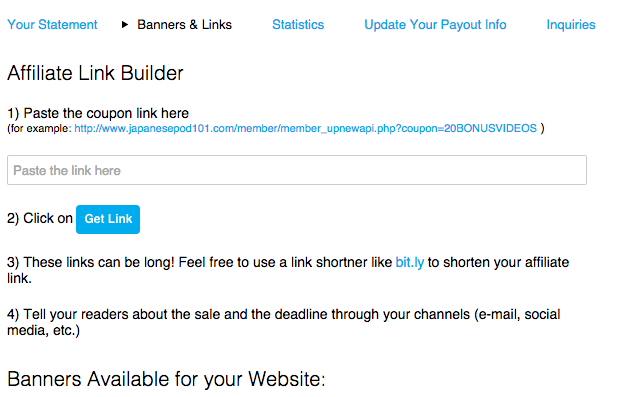 For example, if you’re a JapanesePod101 Affiliate and wish to link to SpanishPod101, you won’t be able to receive credit for linking to SpanishPod101 with your JapanesePod101 Affiliate code. P.S. Want to promote other languages & increase your commission? There are 34 different 101 Language Sites & 34 different Affiliate Programs to choose from. Click on the link below to learn more about our other Affiliate Programs. Click here to learn more about Innovative Language Affiliate Programs. This entry was posted on Thursday, December 26th, 2013 at 10:03 am	and is filed under Affiliates. You can follow any responses to this entry through the RSS 2.0 feed. You can skip to the end and leave a response. Pinging is currently not allowed.